Newcastle have announced that existing season ticket holders will have a price freeze for next season. 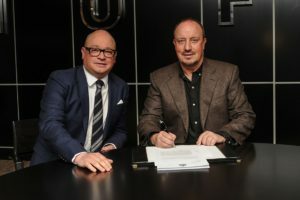 Newcastle are starting to resemble a very well run club and if only Mike Ashley would leave Rafa Benitez in charge of things with the help of Lee Charnley at the executive level to completely run the club, we would continue to get better and better. They work very well together. Why is Mike Ashley always a dark cloud on the horizon?
? SEASON TICKETS: #NUFC have announced a price freeze for existing season ticket holders for 2017/18. This is good news and here’s a link to more information the club have just announced on their web-site. Let’s hope it’s for Premiership football. Another sign that our club is being milked dry and ran by fools..
More cash for the empty transfer pot..
Wonder what the southern press will report this as ..
Ashley said he’s here until we win a trophy. I think the money will be there in the summer and I suspect Rafa has been told that – hence his happier appearance last week. I’m not defending Ashley, just being realistic. He’s sunk 290m into the club, he has to have some control over spending. Let’s hope Rafa wins a trophy next season – the League Cup will do – then he might be happy to move on. I doubt he’ll ever get all his money back and he probably knows that himself. I can live with the irony of him being the first owner to win a domestic trophy in my lifetime as long as he sells to the right person. Sir Jason, you are correct my friend. Haway is most certainly the mackem version. I checked crowds last weekend. There wasn’t a PL gate within 10,000 of our 52K+ gate. All credit to the NUFC faithful. Wonder why the Press hasn’t picked up on it? Oh, I forgot – they only want negative news on NUFC. Now is the time to build on the success Rafa has achieved in the league and improve the entire board. Charnley, Carr and Moncur have failed to protect Benitez from Ashley. NUFC needs a stronger balanced board now. Sorry to sound negative, but could this ST price freeze be an attempt to encourage renewals – before Ashley and Rafa fall out?